Luckily we have one of these 🦄on our side for VOICE. Spencer Uttley, ladies and gentleman. Spence is a passionate creator of tools, working to deliver world class natural language SaaS experiences as the lead of conversational experiences for the QuickBooks Ecosystem, aka "QB Assistant" for small business and self-employed customers. Well...doing taxes is probably the most dreaded time of the year, next to quarterly reporting, of course. So Intuit came up with a super convenient solution for customers to better understand and navigate their finances- the QuickBooks Assistant (conversational chat experience). A virtual assistant side-by-side with business finances? YUP. People can simply tap to ask questions and find answers rather than running reports and analyzing data. This very handy addition solves a common problem for the self-employed as well as small business owners, letting them quickly and easily stay on top of their finances. And this, my friends, is what our starboy Spencer works on. He’s an experienced builder with a high bar for customer experience and a strong track record for delivering results. Does it get better than that? Spencer is a kid at heart and a family-centric person, personally we can’t think of a more admirable trait. Check out this video of Spencer and fam by his brother, Chase Uttley. We had a chance to get a little more personal with Spencer and learn about his first interaction with voice technology. Spencer's first smartphone was an iPhone 4S in 2011 (the first iPhone with Siri), which he got because he was excited about Siri and wanted to experience VoiceFirst interactions. The first thing he told Siri was “tell me a joke” and although he can’t remember the actual joke, he remembers being impressed that it worked. Whatever the case, he’s sure the joke was terrible yet delightful- like most virtual assistant jokes. Spencer was inspired to enter the VoiceFirst world from a demo he saw from the Viv cofounder (later acquired by Samsung) two-ish years ago. Although he was using fairly unstructured language, the virtual assistant was still understanding and getting things done- it blew him away. Spencer has always been energized by building solutions to problems at scale, but would get frustrated when 1) only a small percentage of people who had the problem would try the solution and 2) successfully understand how to use it to solve their problem. With VoiceFirst solutions, users don’t have to know how to USE the solution, they only have to be able to say what their problem is- which is why he loves working to move VoiceFirst experiences forward. Spencer thinks we’re at an inflection point in technology right now, where natural language (text/voice) as an input method will begin to permeate all software and hardware we use. 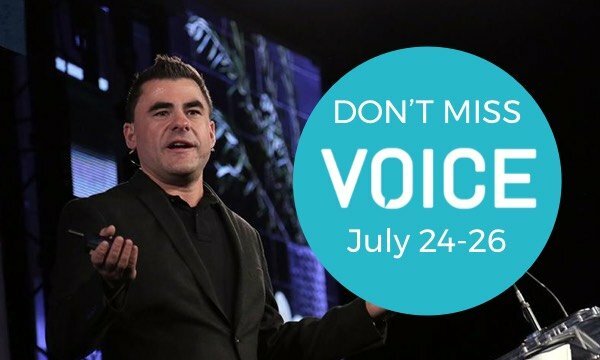 He ventures that by 2021, voice will be our primary input method for any computing task (on a phone, computer, smart speaker, car, appliance, TV, etc) meaning we’ll accomplish more tasks digitally with our voice than we will by typing or clicking. And this excites the s*&! out of him because ultimately, it will allow tech to solve problems significantly faster and easier. And, it will make these solutions to problems infinitely more accessible to people around the world that have been intimidated by today's menu/click-based software solutions. If you’re looking for some recommendations on cool smart assistants, Spence’s fav is OBVIOUSLY the QB Assistant. Off the record though, his favorite smart assistant is Fin, a hybrid human/AI solution that can complete really any request you throw at it. He has a monthly subscription (that’s how good it is), and uses it for things like booking haircuts, updating flight reservations, and more. Just the other morning, he used his voice to ask it to “Send links for three cool Airbnb’s in Amsterdam for May X – May Y priced $Z-A” and received three links within 30 minutes.